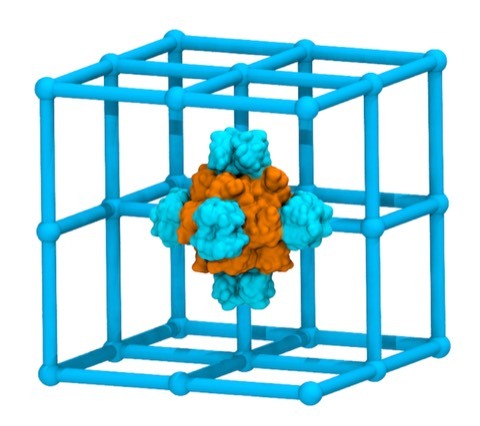 Imiplex Nanosystems Inc (INSI) is a company focused on the development of protein-based nanostructures for a wide variety of metamaterials applications, ranging from biomedical applications to advanced optoelectronics. 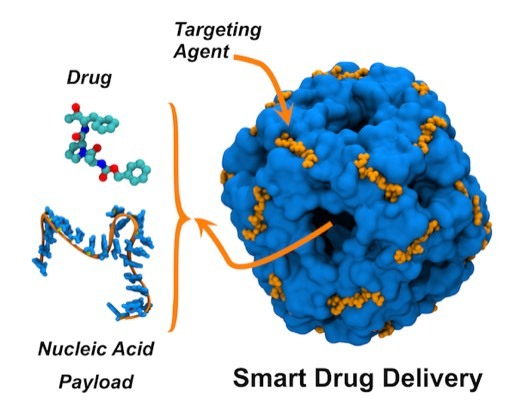 Drug Delivery: Engineered nanostructures can be engineered to provide controlled delivery of drug payloads targeted to specific cell surface receptors, thus improving efficacy and reducing potential side effects. 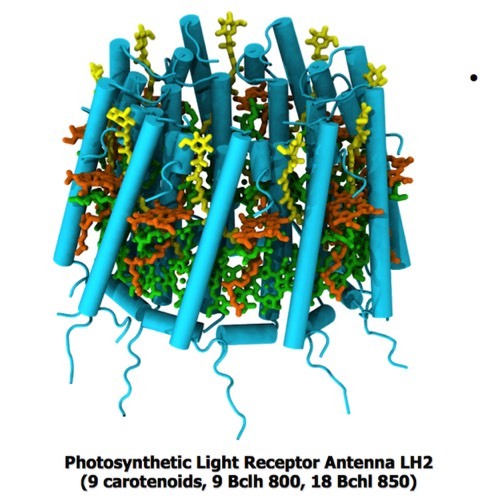 Optoelectronic Devices: Photosynthetic light-capture apparatus. Nature provides many examples demonstrating the precision assembly of multiple prosthetic groups to achieve a specific optoelectronic function. Metamaterial Architecture: Imiplex “struts and nodes” modular assembly technology facilitates the assembly of a multitude of nanolattice assemblies for metamaterial applications. Metamaterials are 3D structures incorporating repetitive nanoscale geometric features. INSI distinguishes two classes of metamaterials; organic metamaterials and inorganic metamaterials. Organic Matematerials: Virtually unlimited opportunities exist for functional nanostructures composed of engineered proteins, here termed organic metamaterials. Engineered protein nanostructures can be designed as components for biosensors and as targeting delivery systems for therapeutic drugs, proteins, and nucleic acids. Examples of advanced materials applications include systems that provide frameworks for redox and organic optical centers to create novel molecular and optoelectronic devices inspired by examples from natural systems such as photosynthetic electron transfer and animal magnetic navigation. Additional opportunities exist that exploit the ability of biological systems to selective transport salt ions across membranes and catalytically convert CO2 to bicarbonate, processes fundament to global technology objectives of water desalinization and greenhouse gas remediation. 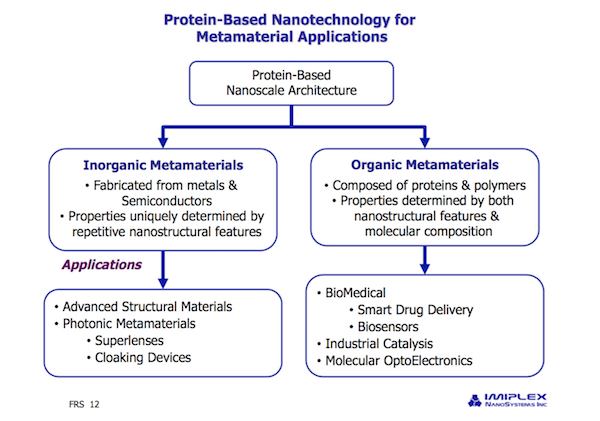 Inorganic Matamaterials: In contrast to organic metamaterials, where protein components provide functional properties to the metamaterial nanostructure, inorganic metamaterials are composed of metallic or semiconductior materials. The properties of inorganic metamaterials are determined solely by their repetitive nanoscale architectural features. Metamaterials repetitively structured at dimensions less that the wavelength of impinging electromagnetic radiation have the ability to bend and modulate that radiation in ways not possible with conventional materials, allowing the fabrication of ultralenses and invisibility cloaks. Up to now, most inorganic metamaterials incorporating nanoscale features have been manufactured using methods based on electron beam lithography. Although such approaches are useful for prototype demonstrations, the sequential nature of the scanning process makes large-scale production of microchip-sized devices commercially impractical. Using such methods for the production of larger-scale assemblies, as required e.g. to provide an aircraft with a metamaterial invisibility cloak, is practically impossible. Imiplex technology overcomes these limitations and exploits a combination of top-down and bottom-up fabrication technology based on the intrinsic self-assembly properties of proteins to create the 3D nanostructures that can be efficiently replicated in metal or semiconductor materials.